It probably didn’t hurt that Mr. Crapper was the official plumber of a few prominent members of the royal family. For instance, he handled all the plumbing and fixtures at Sandringham house, one of the Royal residences, and received Royal warrants from Edward VII and George V.
That said, Crapper did improve the functionality of the toilet. He was a plumber himself, and invented many doo-dads that improved efficiency and sanitation, such as the ballcock, which is the float-triggered flushing mechanism in your toilet. Primitive indoor toilets had been in existence sine Roman times, but the first “modern” flushing toilet in Britain was invented by Sir John Harington in 1596, who installed the first working prototype in the home of his godmother, Elizabeth I. 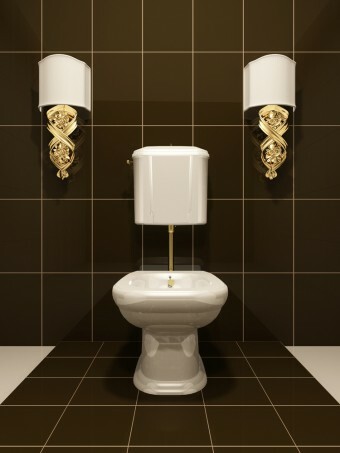 Further, the first patent for a flushing water closet was issued in 1775 to a man named Alexander Cummings – sixty years before the birth of Thomas Crapper. It’s also been commonly believed that the slang term “crap” is derived from Mr.Crapper’s name, because of the obvious association with toilet-related bodily functions. Time to shatter another illusion: the word “crap” is of Middle English origin, and had nothing to do with poop back in the day. While the exact etymology isn’t known, it’s thought that it likely comes from the Dutch word krappen: to cut or pluck off, and the Old French word crappe: waste or junk. In English, people used the word to refer to weeds or garbage, but it had fallen out of popular usage in the UK by the time Mr. Crapper came along. The term “crap,” meaning “refuse”, stuck around in America though, coming over pre-16th century from England. According to the Oxford English Dictionary, it wasn’t used to mean doo-doo until 1846. That said, “The Crapper” as a name for the toilet was partially inspired by Thomas Crapper thanks to WWI. The toilets in England at the time were predominately made by the company “Thomas Crapper & Co Ltd”, with the company’s name stamped on them. American soldiers with their still actively used “crap” word, took to calling these toilets “The Crapper” and brought that slang term for the toilet back with them to the United States after the war.